Thanks to Verna Cole and her team, our annual Christmas bazaar was another success and added over $450.00 to our treasury. That, with the Thanksgiving fruit and nut sale (again thanks to Verna + crew), another over $1,000.00 to our growing treasury! At this writing, we still have a few items left for sale (refrigerated). Contact Verna if interested. February 9th, Weidele’s Pizza and Pub, Rt. 14 in Sterling, is sponsoring a fundraiser for our Lillian Sharpe and family. A pasta special will be served from noon until 4:00 p.m. with all profits going to the family. $15.00 per person. 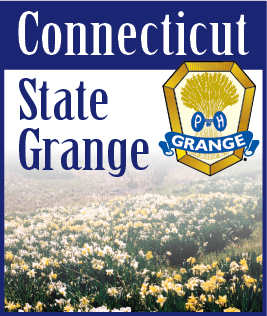 They are also having basket drawings at 3:00 p.m. Then on Sunday, March 24th, Kate Fantoli is sponsoring a Chili Cook Off at our Grange; more details next issue! This is also benefiting the Sharpe family as well as that of Kaycee Chester. Kaycee is a classmate of Lilly who is battling bone cancer for the third time! Have fun trying out different chili recipes, pick your favorite or make up your very own and bring it to Ekonk Community Grange on Sunday, March 24th! Abbey Dexter has stepped up to the plate in admirable fashion taking the helm for Lillian Sharpe until such time as Lillian’s health allows her to return as President. The Juniors are looking forward to their annual Fun Night Feb. 15th at 6:00 p.m.